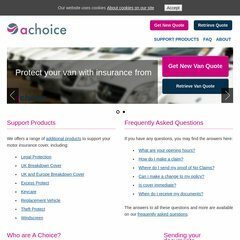 Topics: Get New Quote, Retrieve Quote, Optional Extras, Get New Van Quote, Retrieve Van Quote, and Get New Car Quote. It is hosted by Memset Ltd (England, Surrey,) using Apache web server. ns1.memset.com, ns2.memset.com, and ns3.memset.com are its DNS Nameservers. PHP/5.2.17 is its coding language environment. PING www. (77.73.2.115) 56(84) bytes of data. A time of 98.5 ms, is recorded in a ping test.